The Honda H4514 Lawn Tractor uses the GX360K1 engine. It is a liquid-cooled 2-cylinder gasoline engine producing 14 hp (10.4 kW.) It displaces 358 cc (21.9 ci) from a 2.28 x 2.68 inch (58 x 68 mm) bore and stroke. The tractor weighs 569 lbs (258 kg) with the 38-inch deck and 595 lbs (269 kg) using the 42-inch deck. The tractor has a wheelbase of 46.9 inches (119 cm) and its overall dimensions are 71.5 x 50 x 41.3 inches or 181 x 127 x 104 cm. The engine uses an electric starter, its oil capacity is 1.16 qts (1.1 l), its coolant capacity is 1.85 qts (1.8 l) and it has a fuel capacity of 2.38 gallons (9 liters.) 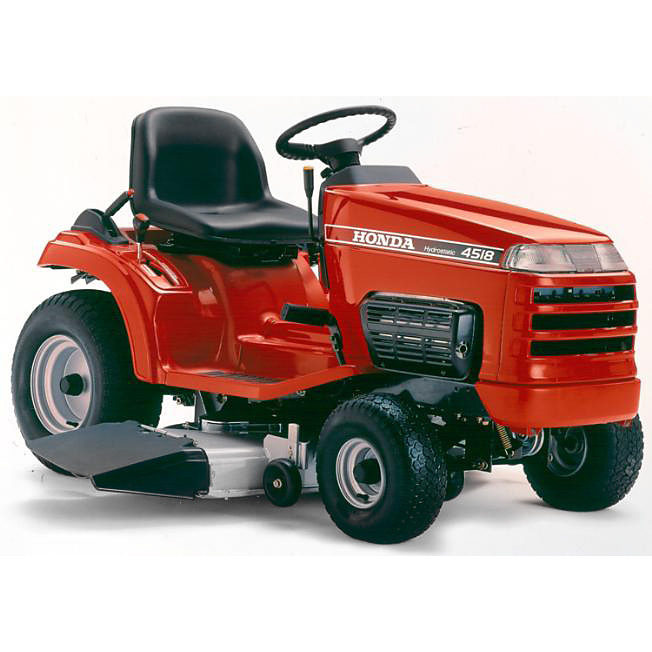 Purchase your Honda H4514 Parts from Honda Lawn Parts now. The Honda H4518 is powered by the 2-cylinder liquid-cooled GX640 gasoline engine. It produces 18 hp (13.4 kW) with a displacement of 634 cc (38.7 ci) using a 3.00 x 2.80 inch (76 x 71 mm) bore and stroke. With a 46-inch deck, it weighs in at 670 lbs (303 kg.) The H4518 has the same wheelbase and overall dimensions as the H4514, but is one cm taller. The tractor includes a 12 volt electric starter and has the same fuel capacity as the H4514. The coolant capacity is 2.9 qts (2.7 l) and the crankcase holds 2.1 qts (2.7 l) of oil. 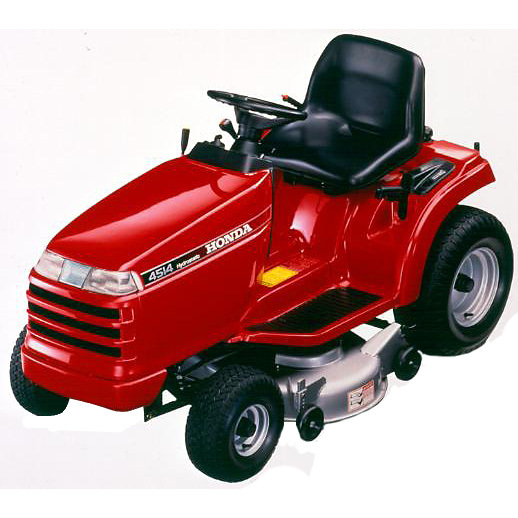 Count on Honda Lawn Parts for your Honda H4518 Parts. Both mowers use a hydrostatic transmission with infinite forward and reverse gears. There is a single control lever that includes a stop for the mowing and transport range. There are three distinct speed ranges: Mow-max, Transport-max and Rev-max. At 3300 rpm, the nominal speed ratings are 3.2 mph (5.1 kph), 4.7 mph (7.6 kph) and 2.1 mph (3.4 kph) respectively. The mid-mount cutting deck is available in three widths on the H4518: 38 inches (96 cm), 42 inches (106 cm) and 46 inches (116 cm.) Only the 38 inch and 42 inch decks are available for the H4514. For temperatures between 14°F (-10°C) and 86°F (30°C) use 10W-30 motor oil. Above 86°F use 10W-40, 20W-40 or 20W-50 oil instead. Below 14°F use 5W oil to keep the motor running well.